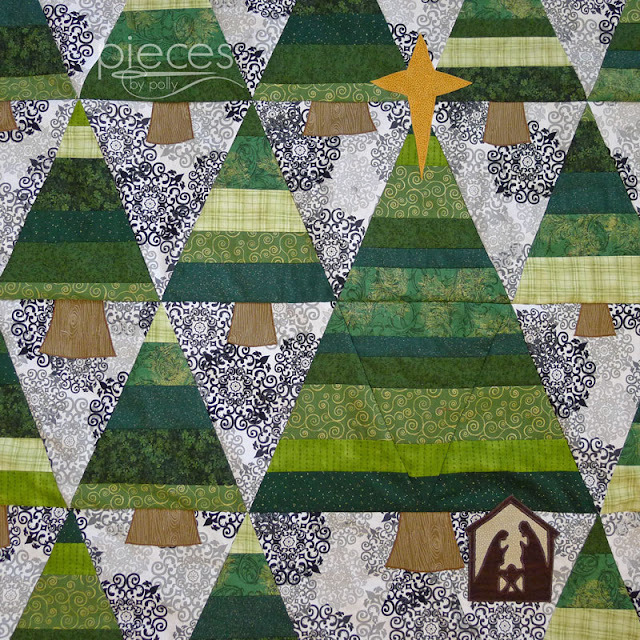 Pieces by Polly: Announcing the Nativity in the Trees Quilt-Along Begins Nov. 8th! 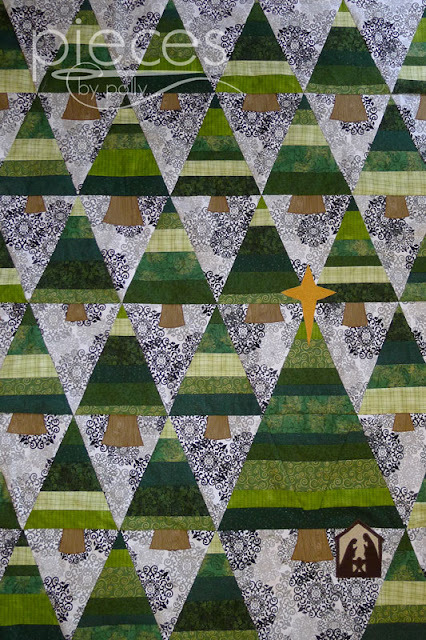 Announcing the Nativity in the Trees Quilt-Along Begins Nov. 8th! 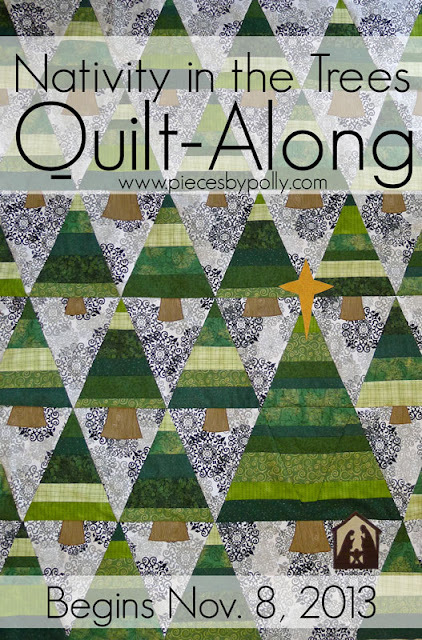 I've been hinting at this for a while...but it's quilt-along time again! Don't be intimidated by what looks like a lot of pieces and angles. We'll take advantage of strip pieces to take care of all those greens That means all those greens were sewn together in long straight strips and then we cut the trees out after the strips are sewn together. That makes the cutting and piecing fast and doable. This pattern isn't quite as easy as the Hexies by Halves Pattern, but it's easy enough that a "Late-beginner" should be able to handle it...probably not a great choice for your very first quilt, but if you've used a rotary cutter before to make a simple quilt, this will be a great quilt to stretch your skills just a bit and take you to the next step. 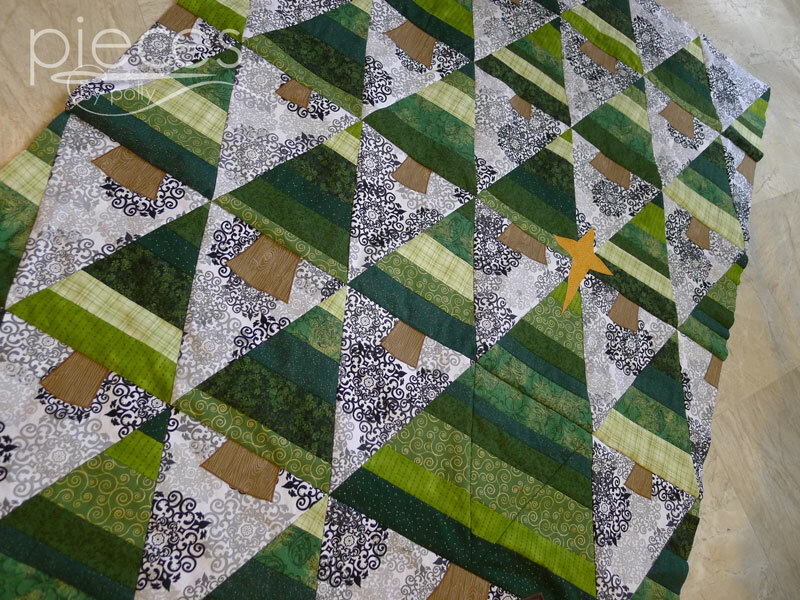 Besides, the strip piecing, you'll also learn to do some satin-stitch applique to sew on the Christmas star, tree trunks, and manger scene. These skills will help you with many more projects to come. 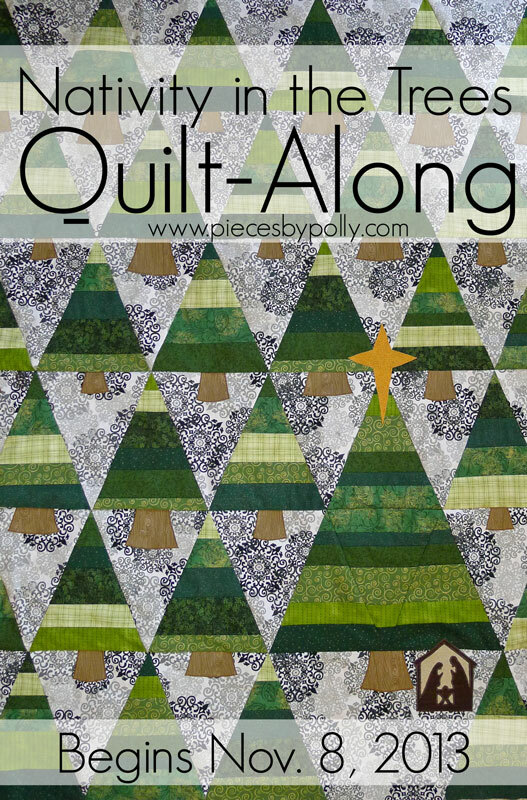 And if you're not up to making a quilt, this pattern can easily be modified into a festive table runner. We'll start off the Quilt-Along on November 8th with information about fabric and supplies needed, so you can take advantage of sales over the holiday weekend to buy anything you may need. I've had this quilt bouncing around in my head for over a year, so it's a lot of fun to see it made out in fabric. If you'd like to participate in the Quilt-Along, I'd like you to fill out the form below, so I'll have your email address to send out announcements and such. 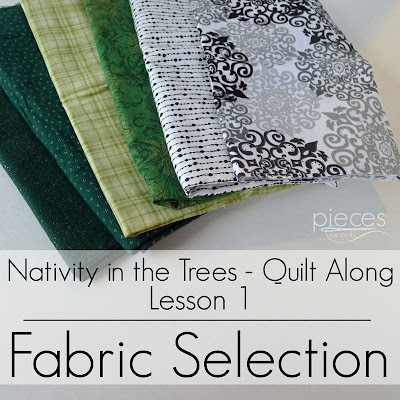 The detailed sewing instructions will appear on my blog in the form of blog posts. Once the quilt-along is over, I'll turn the instructions into a pattern that will be available in my shop. For those who quilt-along and send me a picture of your progress (even if you don't finish before the end), I'll send you a free copy of the finished PDF pattern. 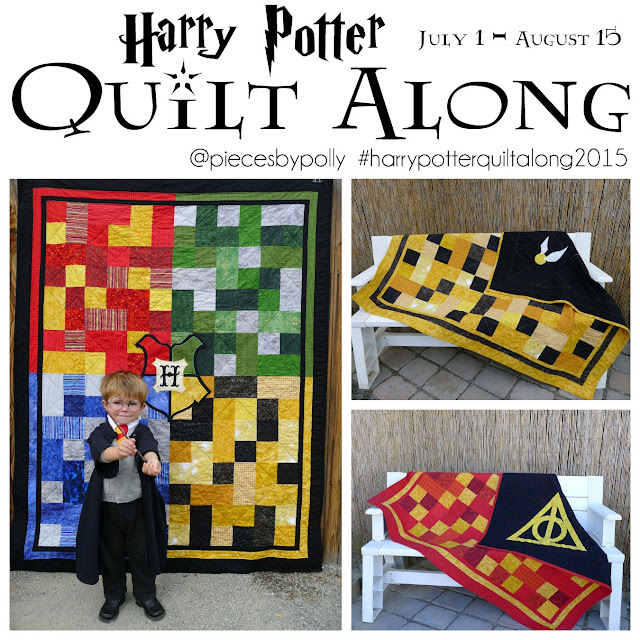 If you sign-up for the quilt-along, but never quite get started (which has happened to me a few times), you'll get a coupon code to by the pattern at a 50% discount. I know this is getting to be a crazy time of year, but I thought if we get things started soon and keep the timeline short, we'll be able to finish up before December. That is lovely! Your last one was so easy to follow along with. My plate is so full right now but I'm pretty sure I'll join in anyway. The last one was really fun! This is so pretty, Polly. I wish I could participate, but I have a huge list to finish before Christmas right now. And moving isn't as easy right now. I can't wait to see how it progresses, though. That is so pretty. 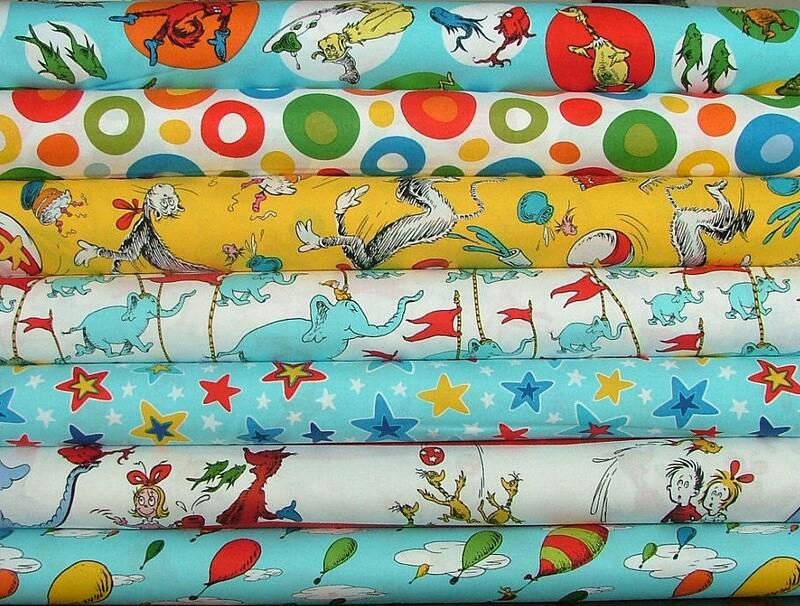 Will you have fabric requirements/instructions for a table runner version? Hi Sandy, Yes, I'll have the fabric requirements for both versions. Fun, fun, fun! I love how it looks. I signed up! This is really beautiful. No idea if I'll have the time to join in or not but if I can I will. Love this! I hope I can keep up...I really shouldn't start something else!! 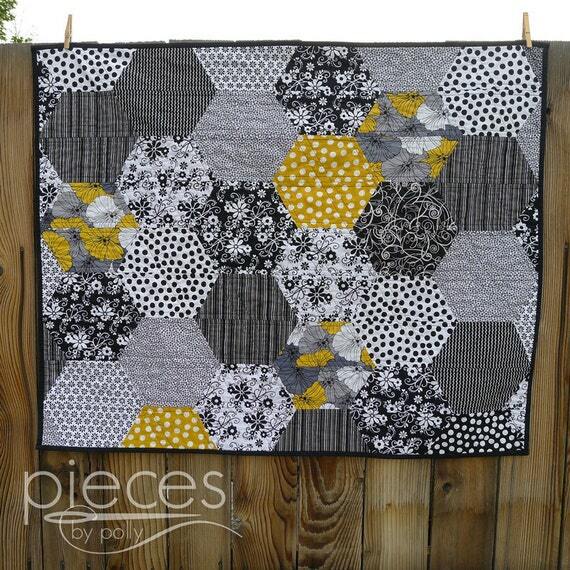 :D I'd love to buy some Holly Taylor prints and make these quilts for all my sibs! What a great quilt a long! 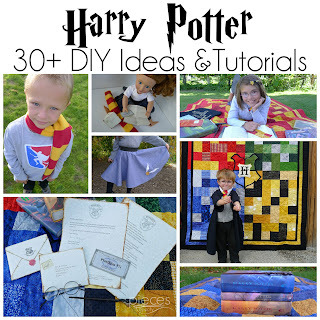 I can't wait to see all the different colours that people go with :) Thanks for linking up!